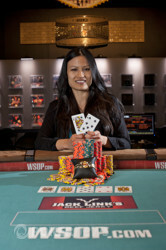 Yen Dang is the WSOP Gold Bracelet Winner in the Ladies Event. What a final day here in the Pavilion Room at the Rio All-Suite Hotel and Casino. After building a big stack on Day 2 and challenging for the lead for much of the day, then grabbing the advantage during the final table, Yen Dang has emerged from a field of 936 as this year's Ladies No-Limit Hold'em Champion! 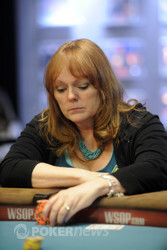 Debbie Pechac, Candida Ross-Powers, and Dang began with the big stacks, and ultimately two of those three would play down to the tourney's final hand. 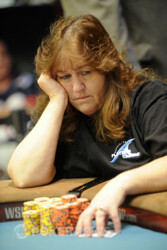 Meanwhile a few players — including Angela Prada-Moed, Jan Howard, and Rosemary Lawrence — returned to relative short stacks.. And in the early going, Rae Rocco would find her stack depleted as well, all of which led to a lot of all-in shoves in the early going. As it happened, Sweden's Ida Lundholm would be the first to fall in ninth not long after Jan Howard doubled through her to leave Lundholm on a short stack. Rosemary Lawrence would follow Howard to the rail shortly thereafter in eighth when her failed to improve against Candida Ross-Powers's . Two more eliminations came shortly after Lawrence's. First Lesley Amos was ousted in seventh after flopping two pair with but running into Yen Dang's Broadway straight. Then Rae Rocco hit the rail in sixth when her pocket tens failed to hold against the of Debbie Pechac. Pechac began today with the chip lead, and became the first player to 1 million chips shortly after knocking out Rocco. Pechac maintained her lead as she watched Yen Dang knock out Candida Ross-Powers in fifth when the latter's failed hold against Dang's . Pechac's fortunes would soon change, however, after a hand versus Jan Howard in which the latter pulled into a virtual tie with Pechac for first. Then a huge hand developed between Pechac and Dang in which Dang was all in before the flop with versus Pechac's , and when the board brought two aces Dang suddenly had more than 1.5 million while Pechac had slipped below 200,000. The bustouts slowed at that point, with the final four battling for some time before a short-stacked Angela Prada-Moed shoved with pocket nines, but unfortunately ran into Dang's to go out in fourth. Three-handed play again saw the pace slow, with Jan Howard's stack gradually getting whittled down before she'd lose an all-in with versus Dang's pocket nines to finish third. Heads-up play between Pechac and Dang would then last about a dozen hands, with Dang enjoying the advantage throughout. Finally, after Dang flopped a pair versus Pechac's open-ended straight draw, the latter's chips went all in and Dang's hand held to give her the title. Dang is giving interviews at the moment, describing her journey from being a law student to learning the game to achieving one of the most desired milestones in all of poker — to win a WSOP bracelet! 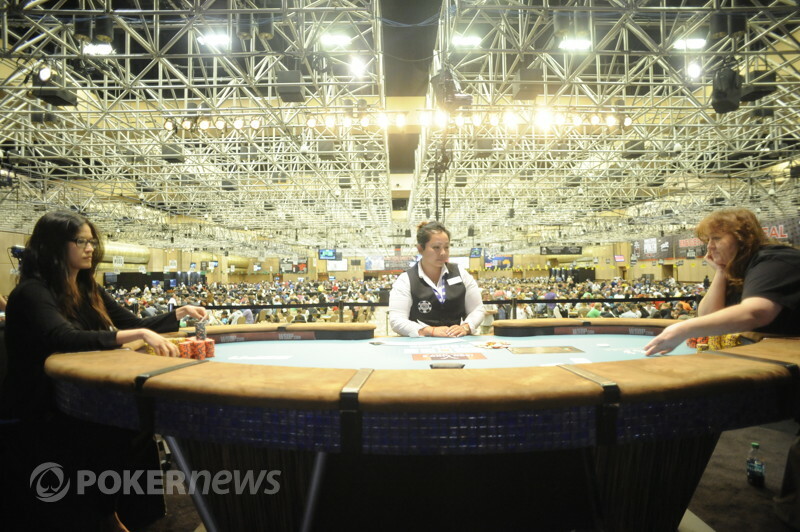 Thanks for following our coverage of Event 51: $1,000 Ladies No-Limit Hold'em Championship, and be sure to stick with PokerNews for coverage of every WSOP event down to the Main Event — starting in less than a week! Debbie Pechac Eliminated in 2nd Place ($105,586); Yen Dang Wins! After about a dozen hands of heads-up play, Yen Dang still enjoyed the chip advantage with which she began when she opened with a raise to 75,000 from the button. Debbie Pechac then reraised to 200,000, and Dang called. The flop came and after just a few seconds Pechac announced she was all in. Dang took a look across the table, then said she was calling. Dang had a pair of queens, while Pechac was hoping to fill an open-ended straight draw. The turn was the , no good to Pechac. Her supporters rose, calling for either an ace or nine, but the river brought the . The chips were counted down just to make sure, but Dang indeed had Pechac covered, thus putting an end to another great ladies event run for Pechac. After finishing 21st and 14th in this event before, Pechac made it all of the way to second this year and a six-figure score. Debbie Pechac limped from the button and Yen Dang checked. The flop came . Dang checked, Pechac bet 100,000, Dang check-raised to 300,000, and without much hesitation Pechac pushed all in for 805,000 total. Dang thought for a few moments, then let her hand go. After trading a few small pots to start heads-up play, Yen Dang limped from the small blind/button, and Debbie Pechac checked her option. The flop came . Pechac led for 60,000, and Dang called. The turn was the , and again Pechac led out with a bet, for 100,000 this time. Dang again made the call. The river was the . Pechac bet one more time, pushing out 100,000 chips, and Dang called once more. Dang showed for treys full of tens, and Pechac turned over her hand — for a lesser full house. Yen Dang begins heads-up play with the chip lead. Jan Howard open-pushed her stack of 305,000 from the button with , and Yen Dang called from the small blind with . The flop came . The on the turn was no help to Howard either. The river then brought the , and Howard's tournament run has ended in third place. After limping in from the small blind, Jan Howard saw Yen Dang reraise all in from the big blind and Howard called for 139,000 total. Howard had and Dang , and after the board came , Howard had doubled her short stack. Debbie Pechac limped from the small blind and Jan Howard checked her option. The flop came . Pechac bet 60,000, and Howard called. The turn brought the and another bet from Pechac, this time for 100,000, and Howard called again. The river brought the and a similar sequence — a 100,000 bet from Pechac, and a rather quick call by Howard. Pechac showed for a pair of treys, good enough as Howard had but ace-high with . We're seeing Yen Dang gradually whittling away at both of her opponent's stacks as she extends her lead. Dang now has about a one million-chip lead over both Jan Howard and Debbie Pechac who are currently battling for second position. The latter pair changed positions on the leaderboard just now in a hand when Pechac opened for 62,000 from the small blind and Howard called from the big blind. The flop came all babies — — and when Pechac checked, Howard bet 40,000. Pechac then check-raised to 100,000, and Howard folded.